Traditional drilling for utility poles like power pole, rail catenary masts and other kinds of pole holes has involved auger drilling or blast hole methods. Wildcat’s Pole Drill System combines with Wildcat DTH Hammer & Hammer Shroud with an advanced air swivel and Wildcat Shock absorber. 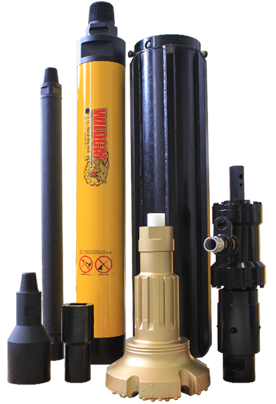 Wildcat Pole Drill System is easy to be Truck Mounted and is a much preferred and cost effective method for drilling pole holes in various kinds of drilling environments. Wildcat can manufacture wide range of custom designed hole sizes for utility poles.